When asked what filling or crown material will last the longest, there is a very simple answer that has held true for over a century now, and it is still true today: Gold crowns, onlays, and dental bridges. Plain and simple, as much as I love doing cosmetic/esthetic dentistry with the ceramic materials available today, I still feel confident that NOTHING will last as long as a gold tooth restoration. To tell the truth, I haven’t always felt that way, but I’ve come to that conclusion based on 11 years of seeing dental work that works over the long-term. For many years after graduating dental school, I never did gold restorations except in extreme situations where it was the only realistic material. But I have seen too many gold crowns, gold onlays, gold inlays, and even gold bridges that are 30-, 40-, or even 50+ years old! While very few dental materials have been in use longer than 30 years, of those, none have had the longevity of gold. So what are the advantages of gold? It can be burnished, or “massaged” hard to the tooth edge to create an amazing seal against bacteria, sugar, acid, etc. Only in the last few years have porcelains reached equivalent seals, and even then the porcelains require absolutely exquisite bonding technique or they’re doomed to early failure. 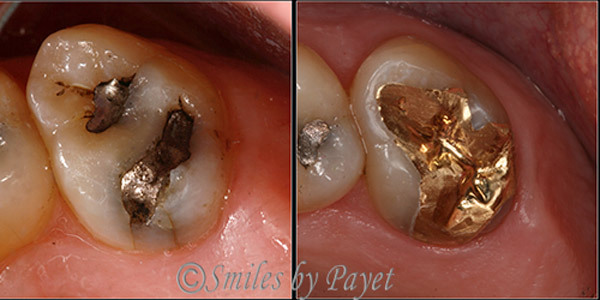 Family dentist Dr. Charles Payet used a gold onlay to fix a cracked tooth that had an old silver filling. The gentleman who chose this is around 40 years old, and with regular dental care and the same excellent home care he has, this tooth and gold onlay will probably last until he is no longer in need of teeth any longer.